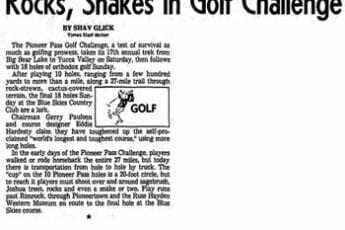 YUCCA VALLEY – The Pioneer Pass Golf Challenge sponsored by the Pioneer Pass Golf Challenge, Inc., is scheduled to take place next weekend. Activities will begin at 1 p.m. Friday at the Yucca Valley Country Club where participants will play the first 18 holes of golf. A kickoff dinner will be held at 7 that evening at Callahan’s restaurant for participants and guests. Playing of the 19th hole will begin Saturday morning at Pioneertown, and continue through Sunday, when participants will complete the event at the Peter Pan Lodge in Big Bear. 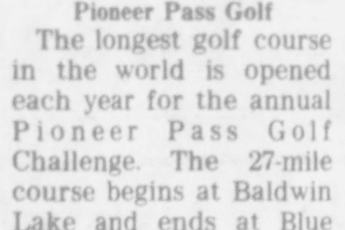 The 19th hole will run 26 miles from Pioneertown to Big Bear, eight miles of which will actually be played. 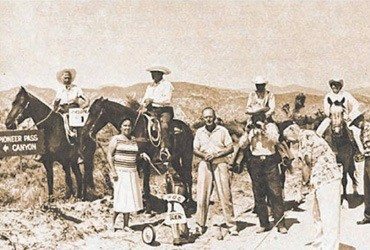 According to Walt Coomes, assistant pro of the Yucca Valley Country Club, last year’s challenge began at Yucca Valley in 75-degree weather and participants were forced to discontinue 2 holes of golf due to heavy snows along the way. Concluding the challenge will be the awards dinner to be held at the Snow Summit Inn in Big Bear Sunday evening, at which time prizes will be presented to the winners.